We had a rough day yesterday. Years of training in housing came in handy when our washer decided to flood our upstairs while we were out. Luckily we came back when we did, for we only had a slight bubble in the downstairs ceiling, and nothing of great value was damaged. Come to find out the hose had slipped out of the machine…whoops. Anywho, this mess along with the non-stop talk about grinding up deer meat and hunting season (we went bow shopping and shooting yesterday), I was glad to do some fall baking this morning. I love baking. For me, it is a stress relief. I have not done much here, because I don’t really have anyone to give it to as I did back in Iowa. You see, I like baking it, but I can’t eat all of it fast enough. And I hate wasting food. I figured, if Tom and I couldn’t polish this off, he could take it into work for those ever hungry Army men. And who doesn’t associate fall with pumpkins? The pumpkin lattes, pumpkin seeds, and pumpkin pie. 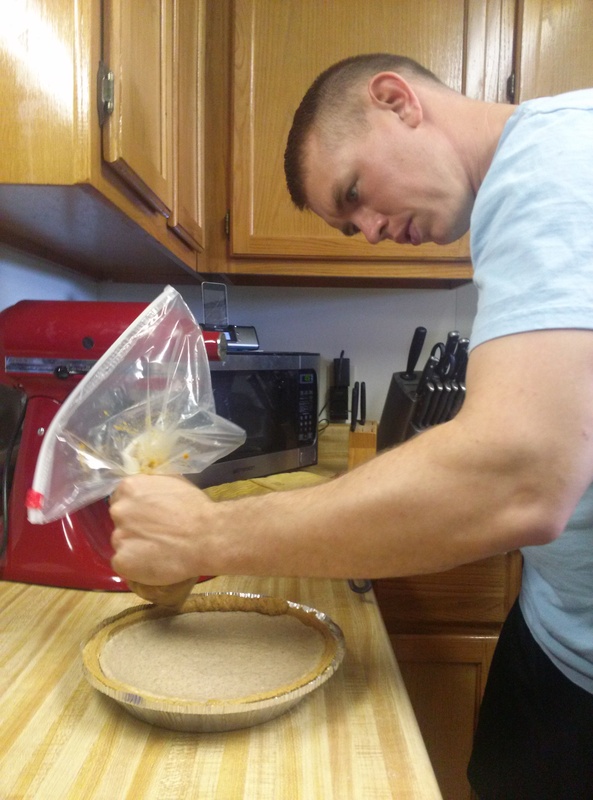 I decided to brush up on my baking by putting a twist on the traditional pumpkin pie. So enter cinnamon cheesecake with pumpkin pie frosting! I did adapt it a little bit. I don’t believe in “bathing” my baked goods…. I also didn’t make individual cups or the crust. I just bought a pre-made pie crust and made one full pie. Did you know that they made pumpkin pie spice? We sure didn’t. You can find it in the spice isle. They also make apple pie spice! Do this first since the cooling time will overlap the cheesecake prep time. Preheat oven to 425 degrees. In a mixing bowl, whisk together all ingredients until well blended. This will be very soupy, so don’t freak out. It will thicken up. Pour into a greased 9-inch pie pan and bake for 30-40 minutes, or until a toothpick inserted into the center of the pie comes out clean. Remove and let cool, then refrigerate. In the bowl of your stand mixer fitted with a paddle attachment, combine the cream cheese and sugar, then mix on medium-speed until smooth. Add eggs, one at a time, fully incorporating each before adding the next. Make sure to scrape down the bowl in between each egg. Add heavy cream, vanilla and cinnamon, and mix until smooth. Do not overmix. Pour batter into each crust-prepared baking cup until 3/4 full. Then place the cheesecake pan in the oven, and bake for about 25 minutes, or until the edges appear to be set and the center still has a slight jiggle to it. Turn off the oven and open the oven door slightly for 5 minutes. Then remove the pan and place on a cooling rack until completely cooled. 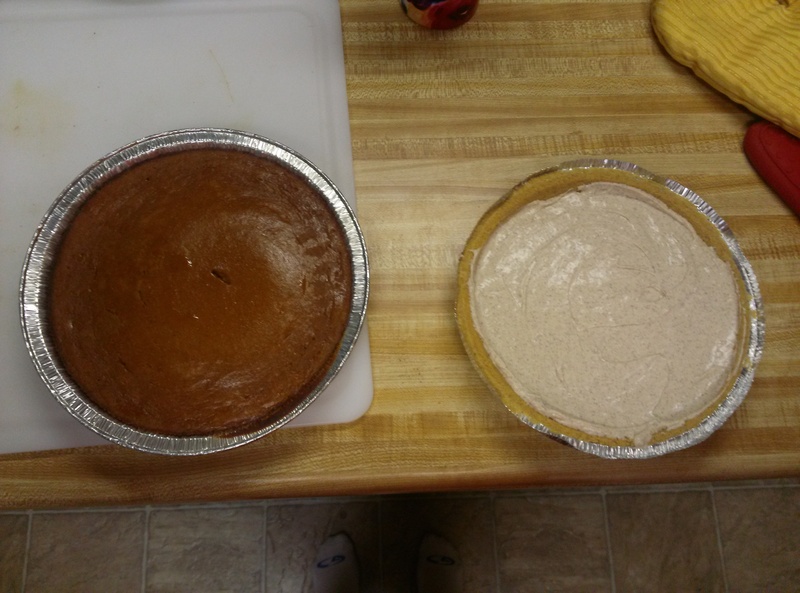 The pumpkin pie frosting is on the left and the cheesecake on the right. They can both stand alone, but definitely make each other better together. When ready to “frost” the cheesecakes, remove the pumpkin pie and spoon the filling into a piping bag. We don’t have a piping bag so we just used a ziplock bag. Use as you would regular frosting. And there you have it! This is super delicious. We just might eat it all…Tom is obsessed with it. This dessert screams fall, and it may make an appearance again this season! Thanks to Gimme Some Oven for the recipe! Now it’s time for you to share your fall recipe! Link up below by clicking the little smiley face dude! The link will stay open until October sometime. Be sure to come back on Thursday for the next Link Up! The theme is “An Autumn Creation.” You can see the full schedule here. 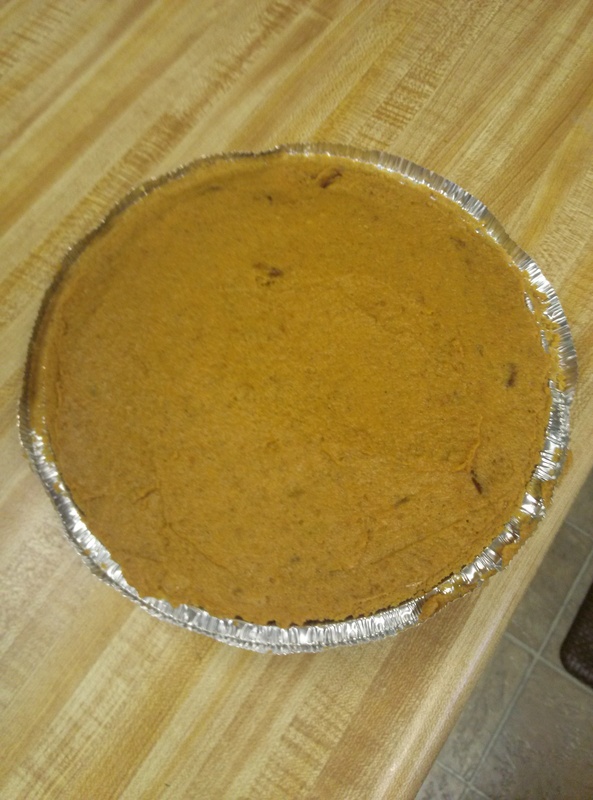 This entry was posted in Recipes and tagged Autumn on My Mind, cinnamon cheesecake, fall food, pumpkin pie frosting, pumpkin pie spice, recipe. Bookmark the permalink. That looks amazing! My husband isn’t a huge fan of cheesecakes, but I love them. So I guess I’ll be eating most of it myself…darn. Maybe with the pumpkin pie frosting he might actually enjoy it! It doesn’t taste like your typical cheesecake! It’s super yummy!